Did someone say Christmas morning breakfast?! 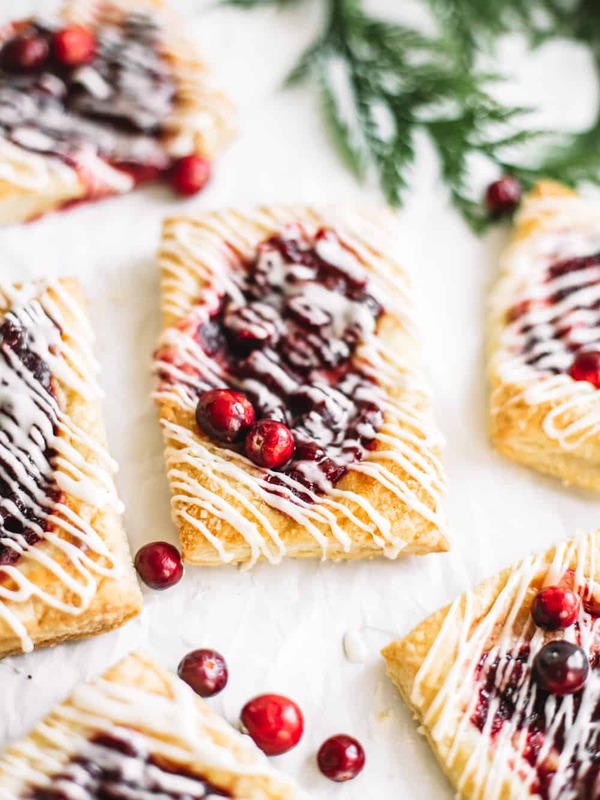 Start Christmas morning on a sweet note with maple cream cheese spiced cranberry pastries! 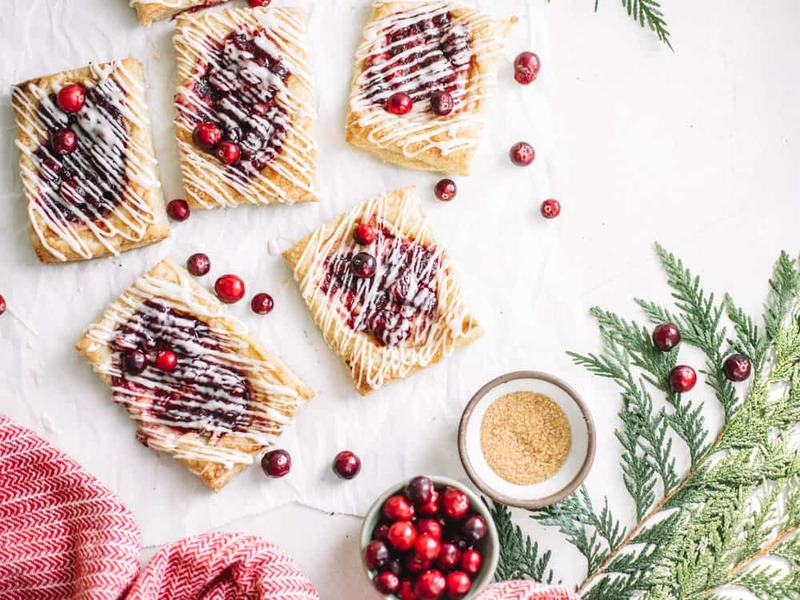 These pastries are a super easy Christmas brunch recipe that can totally be made ahead or the night before! 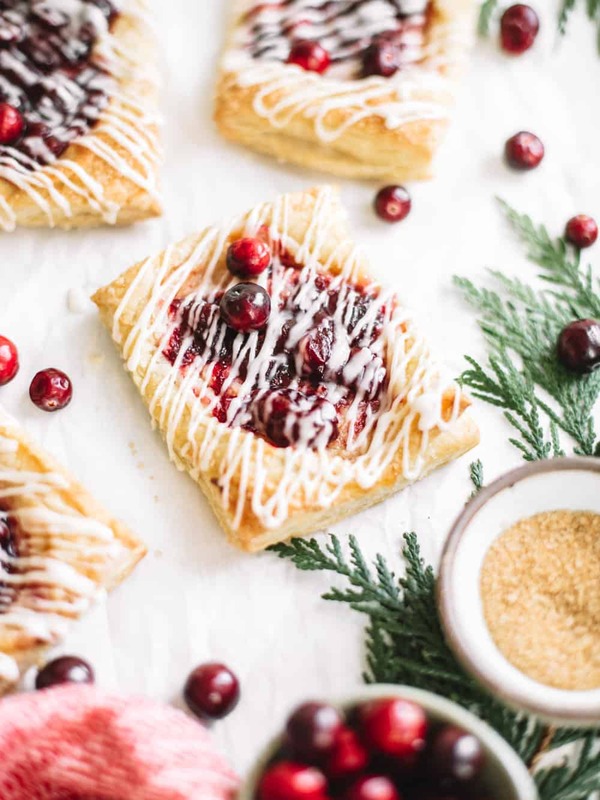 These flaky pastries are topped with a creamy maple cream cheese filling, spiced cranberry jam and topped with a vanilla glaze. Perfect for morning coffee and hot cocoa while you open presents. I like to be totally transparent with you guys and these pastries were 100% inspired by Starbucks ‘Sugar Plum Danish’ on their holiday menu. I’m such a sucker for the holiday menu! I took one bite of this delicious pastry and new I had to try and make it. Starbucks I’m speaking to you when I say this ‘PLUMS ARE OUT OF SEASON!’ Yeah! I said it! Plums are totally not a winter fruit but I appreciate their nod to the nut cracker. They also tasted heavenly, so theres that. I picked the next best thing I could find in the winter fruit selection, fresh cranberries. Honestly, they tasted just as delicious and I ate way too many of them. I promise if you make these for Christmas morning brunch you won’t regret it. Also, puff pastry is so stinking simple to work with. You’re going to love this easy recipe, I promise! For these easy little danishes I just cut out small rectangles of refrigerated puff pastry and topped them off with a simple maple cream cheese and spiked cranberry jelly/compote situation. Baked them for 15 minutes and drizzled them with vanilla icing. You can never have too much icing around the holidays, am I right?! You’ll have a perfect, melt in your mouth pastry in less than a half an hour. Perfect for being half asleep on Christmas morning watching your kids (or your boyfriend) open their presents. Jared, if you’re reading this I can’t wait for Christmas morning, it’s my fav! In a small sauce pan add fresh cranberries, sugar, cinnamon, nutmeg and a pinch of cardamom. Heat on medium heat until cranberries have started to bubble, burst and the mixture begins to resemble jam. About 5-10 minutes. Remove from heat and set aside. In a medium sized bowl mix together softened cream cheese and maple syrup until smooth and creamy. Cut puffy pastry sheets into rectangles. Score the edges with a pairing knife (this will prevent the middle from puffing up!) and sprinkle with turbinado sugar. 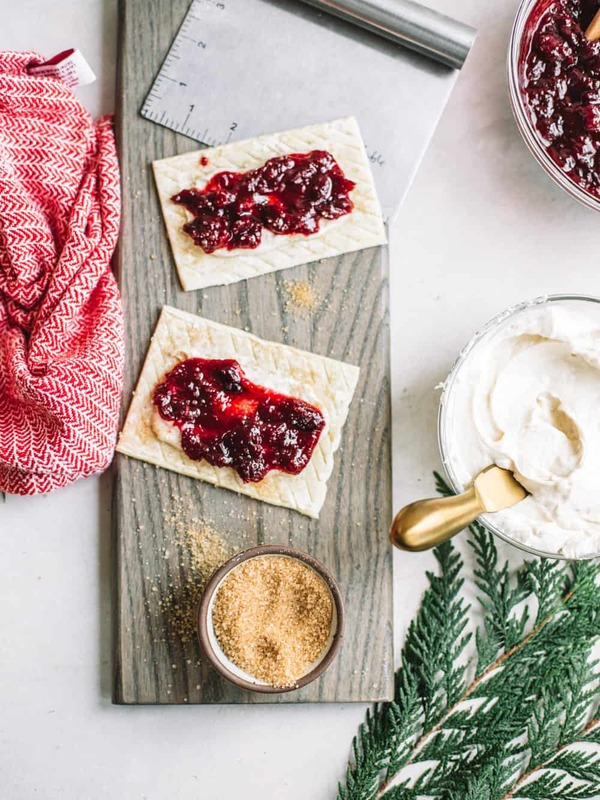 Spread 1-2 tablespoons of maple cream cheese filling and top with 1-2 tablespoons of spiced cranberry mixture. Bake for 15-20 minutes or until the edges of the pastry are puffy and golden brown. In a small bowl whisk together powdered sugar and 1 tablespoon of half and half at a time. More half and half will create a thinner frosting and less will create a thicker frosting. Transfer to a plastic ziplock bag and trim the tip. Drizzle icing over pastries in a diagonal pattern. Did someone say Christmas morning breakfast?! 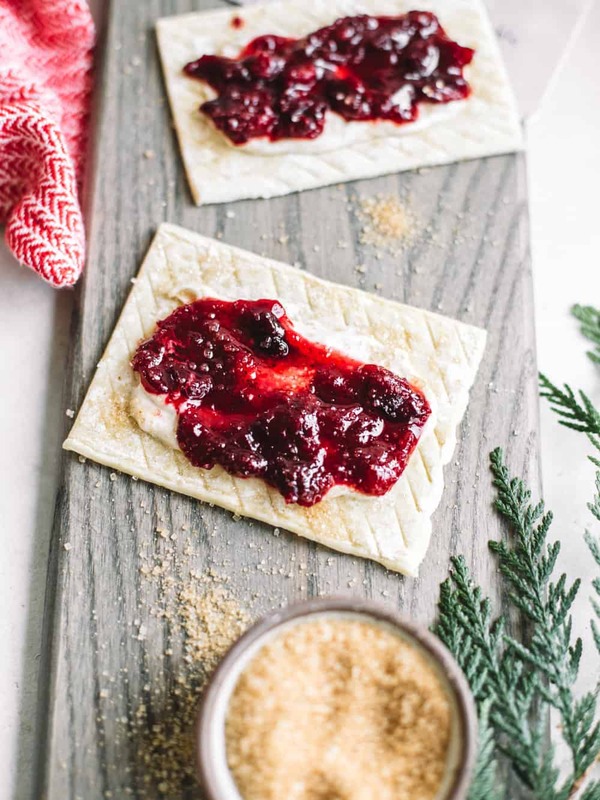 Start Christmas morning on a sweet note with maple cream cheese spiced cranberry pastries! 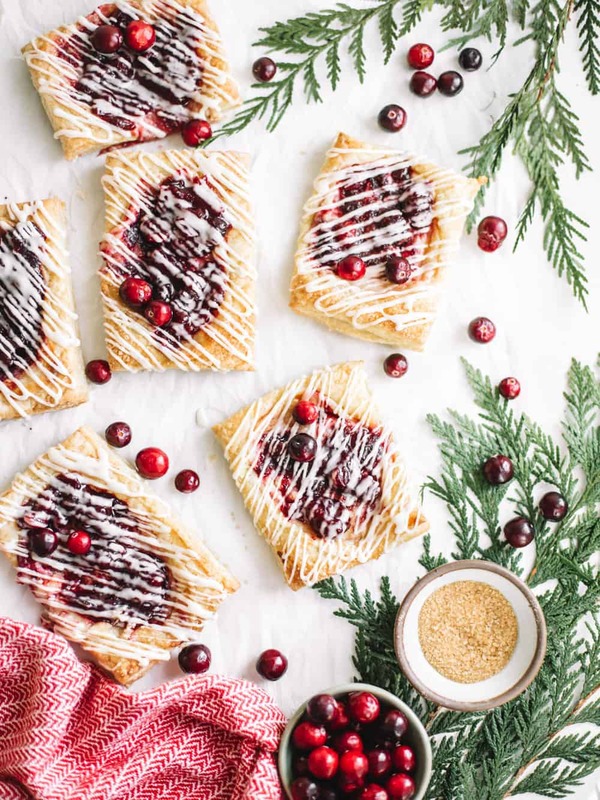 These pastries are a super easy Christmas brunch recipe that can totally be made ahead or the night before! This apple chai bread pudding bundt cake will turn some serious heads at Thanksgiving this year. This rich chai flavored dessert looks like cake but actually tastes like bread pudding. Is your mind blown?! A super easy tiramisu layer cake that is filled with creamy whipped mascarpone frosting and studded with Tim Tam ® biscuits! Mocha almond biscuit fudge ice cream! Mocha almond fudge is hands down one of my favorite ice cream flavors but adding in Tim Tam biscuits to this already delicious creation was hands down one of the best things we did all summer! Scroll down to grab this easy ice cream recipe! Luscious and strawberry lemon cake, filled with tarty lemon curd topped off with a strawberry buttercream frosting! 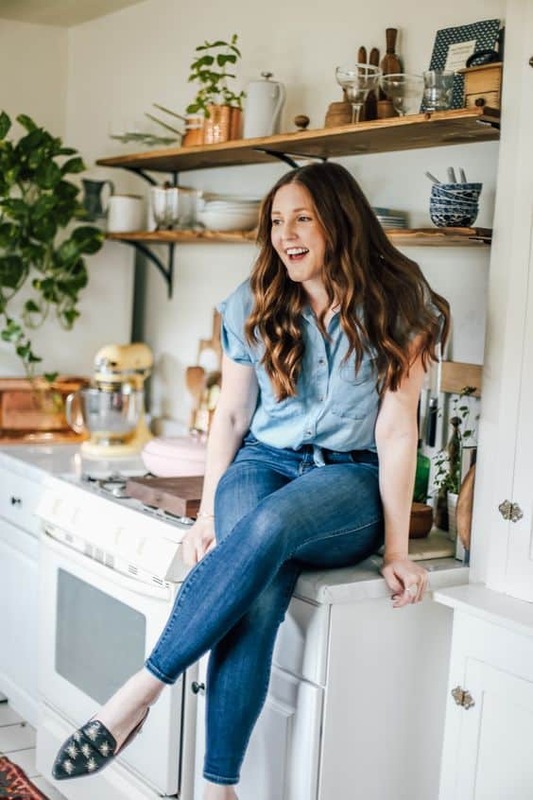 This easy lemon layer cake recipe is made with an easy and moist lemon sponge cake, filled with lemon curd (from Trader Joes!) and topped off with a freeze dried strawberry buttercream. SMEACHES! Graham crackers stuffed with grilled peaches, melty white chocolate and toasted marshmallows! I can’t remember a 4th of July where we didn’t break out some smores for dessert! You can easily assemble all of the smores ingredients on a tray for an easy DIY smores bar dessert table! This classic cherry dessert recipe has an tarty twist with fresh rhubarb chunks! Classic cherry rhubarb cobbler with melty vanilla ice cream is a perfect summer dessert and tasty enough for any dinner party! These browned butter dark chocolate chip pretzel cookies are just the best recipe for a salty sweet treat! Filled with pretzel pieces and dark chocolate chunks for the perfect combo! 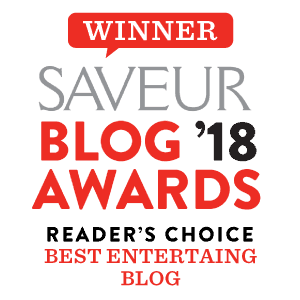 Previous Post How to make a Holiday Crudite Platter with Healthy Dips!